Give humans an inch they would take mile. Give them any opportunity; the possibility of abusing it is not impossible. Over rationalisation of topical issues is not good for the development of a nation. The belief that 'NO ELECTION IS PERFECT' is a bad precedent for our polity as it provides jejune excuse for conducting poor general elections in Nigeria. True, perfection belongs to God; but we must know that minimum standards belong to humans. All over the world, there are standards for gauging and assessing the credibility and performance of electoral activities, especially in democratic nations. These globalstandards must be adheredto inthe conduct of our general elections if we want the outcome of our elections to be recognized by all and sundry across the globe. Nobody can force poorly conducted elections as free, fair and credible elections on their citizens or other countries around the globe. Such attempt should be restricted as part of our civic engagement in working towards a better Nigeria. When elections fall short of global standards and guidelines, the organisers of such elections should be humble enough to admit it rather than take solace in 'NO ELECTION IS PERFECT'SYNDROME. This belief does not encourage hard work, commitment and dedication on the part of all the major stakeholders handling our electoral matters. It gives room for all kinds of electoral abuses to be accommodated in our polity as something normal. Therefore, it is petty, lame and highly scandalous to use such maxim as the only defense for conducting and organizing elections that are not transparent, credible, free and fair. Conducting a free and fair election is not a rocket science. We only need to plan and prepare for elections adequately without any fear or favour. The 2019 general election is not our first and only general election since the return of democracy in 1999. Between 1999 and 2019, we have had six general elections. After every general election, we cannot be saying NO ELECTION IS PERFECT even when it becomes very obvious that the previous election is far better than the current one. In 2015, the general election was largely credible, fair and free. Hence, we must be circumspect enough to insist that the 2019 general election is nothing but a far cry from what we had in 2015. While we are hoping for better elections in future, we must first accept our present conditions/realities to make any meaningful progress. All the measures that our electoral body plans to introduce in future to make our elections better depend largely on the bitter lessons we could make out of the 2019 elections. I have listened and watched with utter dismay how people use this maxim to defend/rationalize vote buying, voter intimidation by political thugs, militarization, violence and loss of lives. On many occasions, the electoral body in their replies to queries of their preparedness and conduct of general elections often start and end with NO ELECTION IS PERFECT without offering far reaching explanations or showing remorse or regret for their errors. I am not surprised though because provisioning of basic infrastructure and social amenities has been made to look like a complex issue in our society. This is because we have allowed and tolerated incompetent, clueless and visionless leaders at the helms of our affairs for too long that we have now made simple problems to snowballinto big and complex issues that have no solutions. This explains why leaders throw up all kinds of flimsy excuses to cover their wombling and fumbling performances in government. The most consequential effect of this maxim, especially in our polity, is that it could prevent us from having and enjoying a serious and robust conversation around electoral matters in the country . When both leaders and their followers carry on their heads this idea of NO ELECTION IS PERFECT they would never address the root causes of electoral frauds in their country. Nigeria must not be allowed to degenerate to a level where we gloss over serious crimes in our polity and electoral matters. We must also know that legitimacy in a democratic dispensation is tied to conducting and organising credible elections. To this end, as soon as the 2019 elections are over, I call on our electoral body to swing into full actions by doing a forensic analysis of the whole events that happened during and after the electioneering periods. It must go back to the drawing board with a view to ask and answer the toughest questions pertaining to our elections in future. This is no time to pretend that all went far well in the 2019 elections. The leadership of our electoral body must equally strengthen her existing collaborations and partnerships with all the major stakeholders, both home and abroad. Voter education must begin in earnest, uncollected permanent voters ‘cards in their custody must be given to their owners by all means possible. Those who contributed directly or indirectly to the successful disruption and sabotage of our electoral processes must be identified and prosecuted according to the laws of our land. Ultimately, the electoral body must see to the quick signinginto law of the Electoral Act(as amended by the 8th National Assembly) by the President for its full implementation to start now. 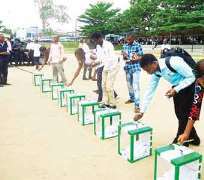 Nigeria must not be made a laughing stock in 2023 on account of another poorly conducted general elections. Disclaimer: "The views/contents expressed in this article are the sole responsibility of Shamsudeen Ayeni and do not necessarily reflect those of The Nigerian Voice. The Nigerian Voice will not be responsible or liable for any inaccurate or incorrect statements contained in this article."